The remains of five Archbishops of Canterbury have been found beneath a medieval parish church next to Lambeth Palace, the Archbishop of Canterbury's official London residence. Builders renovating the Garden Museum, housed at the deconsecrated church of St Mary-at-Lambeth, found a hidden crypt containing 30 lead coffins. 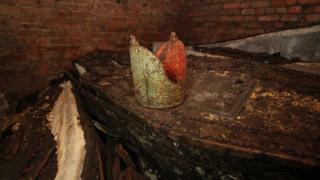 Site manager Karl Patten said: "We discovered numerous coffins - and one of them had a gold crown on top of it". The remains date back to the 1660s. Mr Patten, from the building contractors Rooff, said his team were exposing the ground, lifting the flagstones in the church, when they uncovered an entry to what looked like a tomb. They used a mobile phone camera on the end of a stick to search the void. Garden Museum Director Christopher Woodward said he received a call from the builders and immediately assumed something had gone wrong with the project. "But wow, it was the crown - it's the mitre of an archbishop, glowing in the dark," he said. The red and gold mitre was resting on top of one of the coffins - which were stacked on top of each other in a brick-lined vault. The Sunday Telegraph's Harry Mount, the first outsider to be granted access, said: "It is a spine-tingling view". The coffins have been left undisturbed, though builders have installed a glass panel in the chancel floor above them for visitors to catch a glimpse. Two of the coffins had nameplates - one for Richard Bancroft (in office from 1604 to 1610) and one for John Moore (1783 to 1805) whose wife, Catherine Moore, also had a coffin plate. Bancroft was the chief overseer of the publication of a new English translation of the Bible - the King James Bible - which began in 1604 and was published in 1611. According to Mr Mount, St Mary-at-Lambeth's records have since revealed that a further three archbishops were probably buried in the vault: Frederick Cornwallis (in office 1768 to 1783), Matthew Hutton (1757 to 1758) and Thomas Tenison (1695 to 1715). A sixth, Thomas Secker (1758 to 1768) had his internal organs buried in a canister in the churchyard. Also identified from coffin plates was the Dean of Arches John Bettesworth (who lived from 1677 to 1751) - the judge who sits at the ecclesiastical court of the Archbishop of Canterbury. Beyond that, Mr Woodward said: "We still don't know who else is down there". However, further clues may lie in the history of the church. One of the most sacred and precious sites in London, St Mary's was built in the 11th Century along London's Embankment, opposite Westminster Abbey, by St Edward the Confessor's sister. Mr Woodward said: "This church had two lives: it was the parish church of Lambeth, this little village by the river…but it was also a kind of annex to Lambeth Palace itself. "And over the centuries a significant number of the archbishops' families and archbishops themselves chose to worship here, and chose to be buried here." Though the church is steeped in history, Mr Woodward and his team did not expect to make such an exciting discovery. He said: "We thought there was no crypt because it's so close to the Thames that it would have been flooded. "The Victorians cleared hundreds, if not thousands, of coffins out [of the grounds] to make this new building - nobody told us to expect to find anything." Wesley Kerr, chair of the Heritage Lottery Fund from 2007 to 2014, said: "This is really astonishing - this is one of the most incredible things I've seen… To know that possibly the person that commissioned the King James Bible is buried here is the most incredible discovery and greatly adds to the texture of this project." Deconsecrated in 1972, St Mary's was due to be demolished before becoming the Garden Museum. In October 2015, the museum closed for 18 months to undergo a £7.5m redevelopment project and is due to reopen next month.